Like director Alfred Hitchcock and producer Stan Lee before him, M. Night Shyamalan has a habit of popping up in his films. His latest movie is no exception, with the film auteur making a cameo appearance in “Glass” as a customer at a home-security store. The brief scene is gently amusing, in a way that the writer-director is otherwise not, in this annoyingly self-referential – and self-indulgent – superhero story. But that’s where the comparisons to Hitchcock and Lee end. “Glass” is a movie so muddled and so meta that it not only seeks to remind you – implicitly, and every five minutes – how movies work, but it includes a character who explicitly comments upon the action. That character, played by Samuel L. Jackson, lends the film its title. Elijah Price, a devotee of comics literature who has adopted the moniker of Mr. Glass (for the propensity of his bones to shatter at the slightest bump), doesn’t talk for much of the film, but when he does start, he’s like the nerd in the seat next to you who won’t shut up. 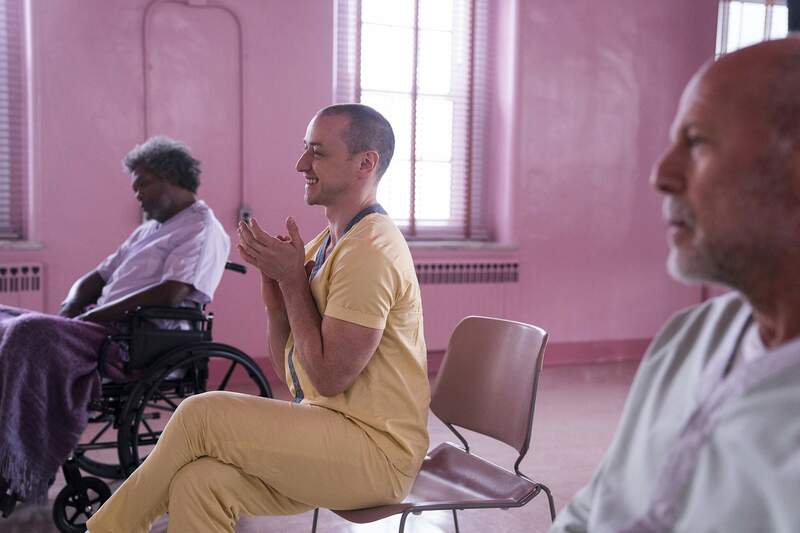 Speaking of showboating, “Glass” begins with a bold sequence of short scenes, separated with smash-cuts, that set the stage for what follows. Kevin is still busy abducting and murdering teenage girls in Philly. Meanwhile, David, clad in the green rain parka that is his superhero suit, has undertaken to hunt him down. After the two meet, briefly fight and are captured by police, they are summarily committed to a psychiatric hospital. It is there that they encounter Elijah, a fellow patient who appears to be in a drug-induced, catatonic state. For the first half of the film, Jackson is given little to do beyond twitch his facial muscles, depriving us of one of filmdom’s most consistent pleasures. Warning: If you have seen neither “Unbreakable” not “Split,” you may be utterly and irredeemably lost. Shyamalan cares not a whit about – and is probably incapable of making – a stand-alone film that will appeal to a general audience. This one is for the die-hards. It is also at the hospital that we meet Dr. Ellie Staple (Sarah Paulson), the psychiatrist who has been tasked with curing these three men of what she calls their “delusion” that they have superpowers. For some reason, she has been given a deadline of three days. Why? Because Shyamalan says so. It’s just one of numerous illogical plot contrivances introduced by the filmmaker that serve no purpose except to gin up suspense, as the hero, the villain and the mastermind converge toward their inevitable showdown. Except there is no actual suspense. Clearly, Shyamalan’s aim, in this, his three-part magnum opus, is to deconstruct the superhero myth to see how it works. But he takes it apart in such a way – with Elijah periodically offering analysis of the action, like a pedantic college professor explaining why a joke is funny – that it no longer functions as actual entertainment. If you disassemble the inner workings of a clock, you have to remember to put them back together. You know what movie was a smart (and entertaining) deconstruction of the superhero myth? “The Incredibles,” and its recent sequel, “Incredibles 2.” The only thing that “Glass” has in common with those two films is that it’s also literally incredible – and not in a good way.